A few weeks back after I finished my dining room table my family suggested we have Thanksgiving dinner at our house this year. Right away I got to thinking about how I would pull this off! But then after the panic eased I got excited and started thinking about how I could decorate! 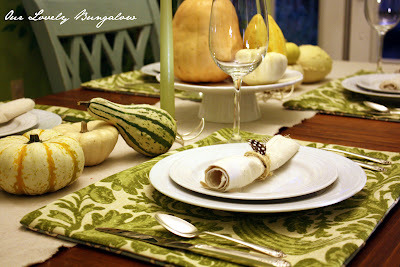 Since I had worked so hard on refinishing our table, I thought I should make some festive placemats. I went to Joann's fabrics but I couldn't find anything that really jumped out at me. The fall inspired fabrics were to "fall-y" for me so I thought maybe I could use something nontraditional but still formal enough for the occasion. 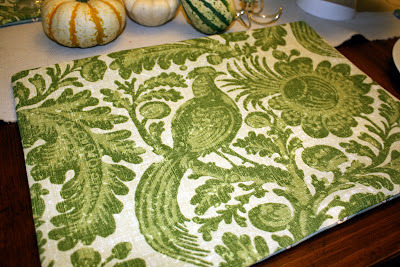 I searched on Joann's website and found a Waverly fabric I really liked, "Tucker" in the moss color. I know, moss not a traditional color choice for fall but it works with the colors in our dining room (blue and green) and the print seemed to fit. Nothing says Thanksgiving like a pheasant...........well I guess turkey, but they are along the same lines, right? 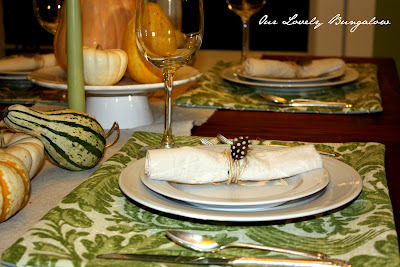 And the green would double for Christmas placemats as well.....Woohoo, I was on a roll! And being all about multiple uses I figured I could put different prints on either side so I chose a more everyday fabric in Waverly's Chippendale Fretwork in mineral blue. 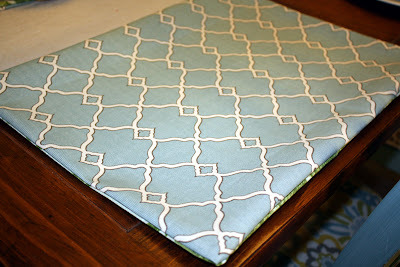 I found the fabric for cheaper on Ebay in an indoor/outdoor fabric which would make them easy to clean if there are any spills. Perfecto! Here's a little sneak peak at how things came together. I did a little fall-inspired decorating just to show that it does work for the season. Now to the details. 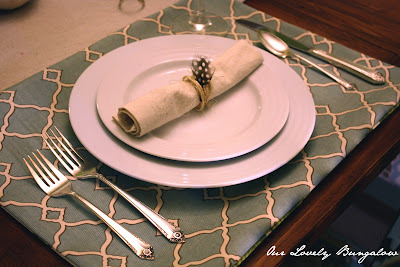 I wasn't sure the measurements of placemats as I didn't previously have any so I did a little scouting at Target. 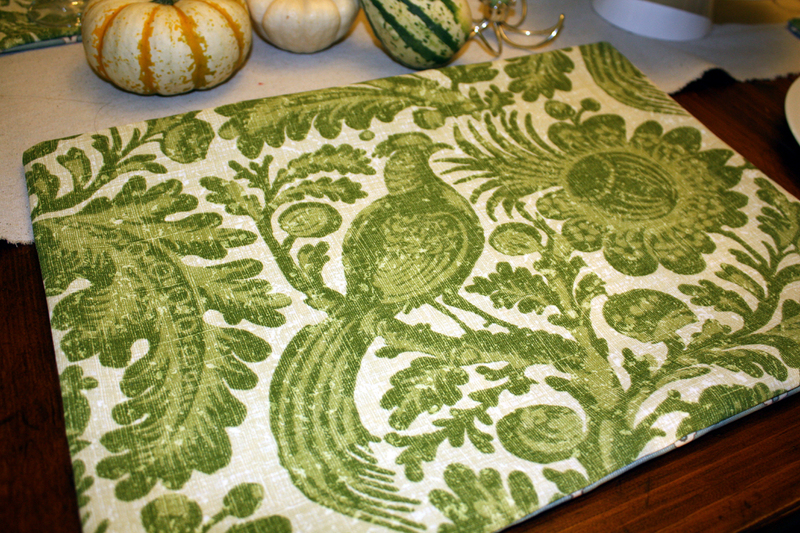 I found the placemat isle and looked at the measurements on the price tags, 14"x19". So that probably translates to fabric cut to 15"x20" with 1/2" seams. 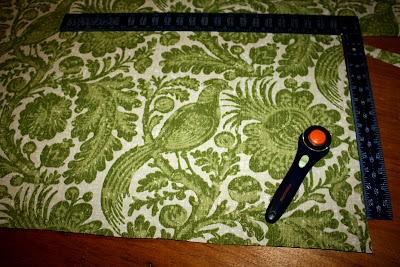 I measured things out on my fabric and used a right angle to make sure things were straight. 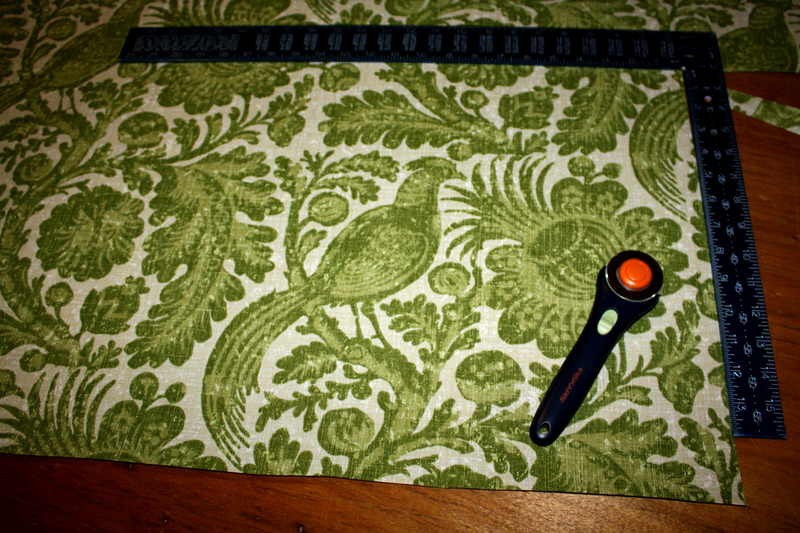 I tried to keep the pheasant to the center of the fabric so I wouldn't have any headless birds. 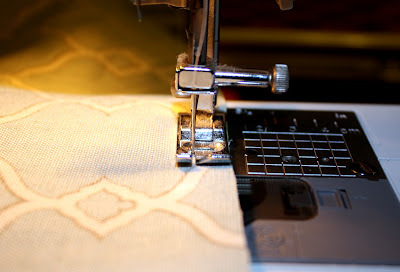 For sewing, I placed the two good sides of the fabric together and sewed around the edges, leaving a few inches open at the bottom for flipping the fabric right side out. 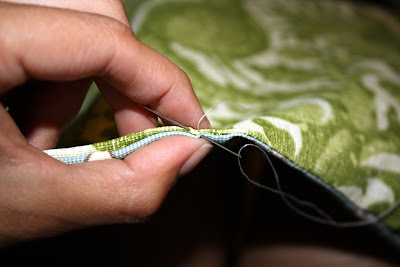 I'm not sure my seams were exactly 1/2", I made all the seams the width of the sewing foot because I find that easier. After flipping the fabric right side out I hand sewed the remaining opening closed. Then I got to work decorating the table. I used a strip of canvas from a drop cloth as a runner down the center of the table. I also bought a few pumpkins and gourds at our local farmers' market that I placed down the length of the table and on a cakestand in the center. For the cloth napkins, I had left over guinea feathers I had used for boutonniere decoration for our wedding that I held in place with twine. And I got out the vintage silver my Grandma gave me as a wedding present. I'm so excited about how things turned out, I can't wait to share it with my family! I absolutely love these! They are gorgeous. I love the "non-traditional" look that you created. The green fabric ties in well with the gourds and pumpkins. I love the other side too. You'll be able to use these all year. Thanks so much for sharing! I'm inspired. The colours look fabulous - you've done a lovely job.